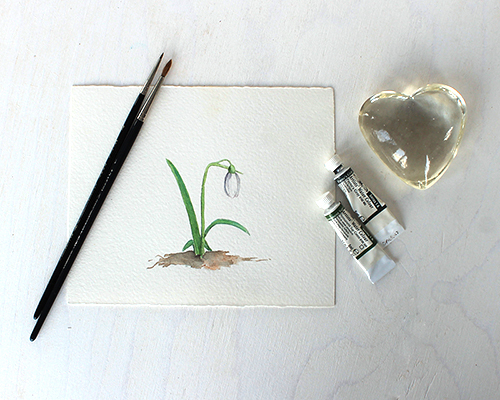 With Valentine's Day over, I changed my Facebook profile photo from a heart painting to one I did of a snowdrop about seven or eight years ago. I've used it as a profile photo before. Seeing it on my Facebook page made me want to get out the original painting. I still have it in one of my studio drawers. It's one of those paintings that I think I will hold onto forever as it has special significance to me. 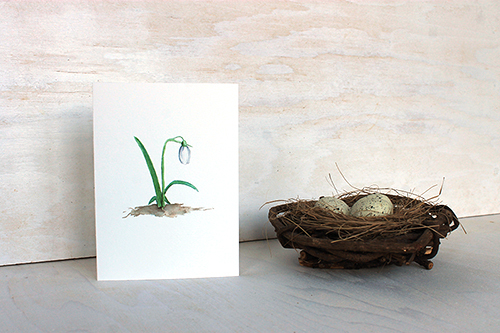 This snowdrop painting was the first watercolour I completed after that period. I wasn't trying to choose a subject with deep meaning. I just sifted through reference photos I had taken of flowers in my garden and selected it. Without trying to choose a subject with a deep meaning, I did. The snowdrop (Galanthus) is one of the first flowers to emerge in the garden after the winter. What better subject could I have chosen after a long period of creative block. I still like the painting. It is simple and elegant. It seems like the perfect image of hope as I deal with my annual case of February blues and as many of us deal with this difficult winter. In Montreal, we have had ongoing snow accumulation and intense cold but nothing like the extraordinary blizzards and snowfalls on the east coast of Canada and the US. I feel for you. 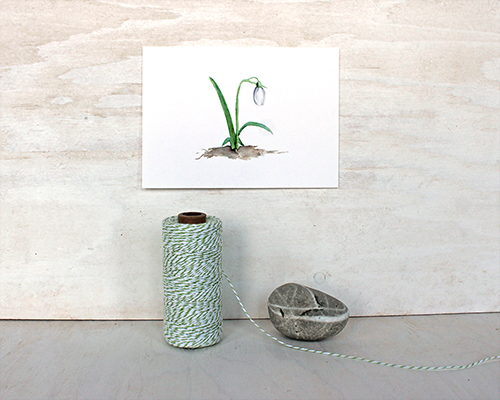 If you need a little spring encouragement, I sell my snowdrop image both as a print and note card. Here's to spring flowers, hope and becoming unfrozen. A very lovely snowdrop, indeed! Thank you! I think they are such lovely flowers.